Marooners is a collection of multiplayer mini-games with the potential to be quite a lot of fun. There is no single player component to this game so you will either need to enlist some friends or hit the online matchmaking to play it. 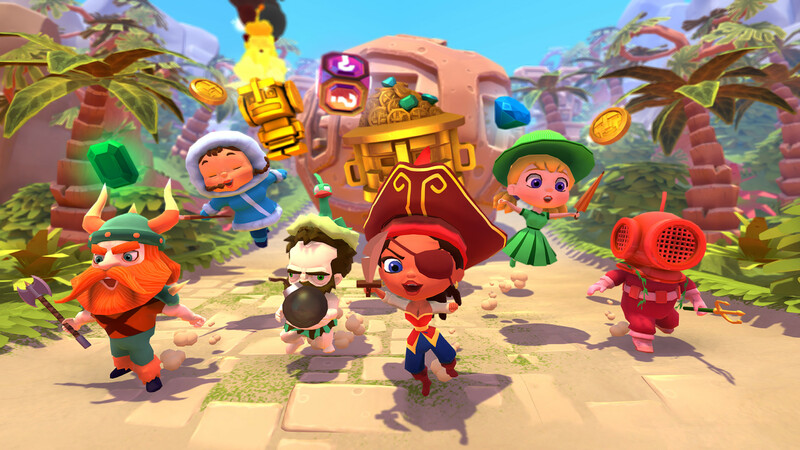 Matches with up to six players compete to stay alive the longest and collect the most treasure in order to win the round. Unfortunately, despite my best efforts, after an entire week of trying, I only ever managed to get into one six player game online. Most of the time I was lucky to even get into a two player game. Let’s face it, the game is a new release and has no dedicated playerbase at the moment so you will be lucky if you get to play the game online. Currently there is a promotion going on where if you buy the game you get another copy free to share with a friend. That friend in turn can share a copy of the game with someone else, and so on. Unfortunately even this promotion doesn’t seem to be enough to bring up the player base to a workable level. With that warning aside, let’s talk about my experience with this game when I actually got to play it. There are two modes in this game. Party and Arena. In Party mode you play a variety of fun mini-games selected from the games small pool of mini-games. Each time you play you will be presented with a different random selection of stages from that pool. Occasionally you will enter Easter Egg mode and end up playing the same mini-game repeatedly until the end of the round. Your objective for each mini-game boils down to the same idea. Not just be the last one to survive whatever challenge the mini-game presents but also be the one who collects the most treasure. The games themselves are all fairly simple and straightforward. Perhaps a round will involve staying in the light to avoid being squashed like a bug or to keep moving to prevent the ground from falling out from under you. Watch out! If you are not careful a block could easily fall on your head, you could get scorched into cinders by a fire-ball or even get bowled over by an Indiana Jones style boulder. Maybe digging down as fast as you can will help you avoid being crushed by the crumbling ceiling. Possibly you could try playing keep-away with an idol or climbing a tower to avoid getting burned by the rising lava, etc. There is enough variety in the mini-games to keep them fun. In the Arena, you are in a death match. Your objective is to stay alive while trying to kill everyone else. The longer you stay alive, the higher your score will rise. If you kill someone you also get additional points. The one who survives the longest tends to win the stage. The twist to this game is that you don’t typically get to complete a mini-game before being thrust into another one. The game hops from game to game, resuming previously played mini-games exactly where they were prior to hoping out of it. This can lead to a bit of a fun chaotic experience as the game might have hopped out while you were in danger or mid-jump leaving you to have to quickly scramble once the mini-game resumes to avoid your demise. I played this online in a two player match with a friend of mine. He had his microphone on so I could hear him laughing and commenting on things as we played. I’d have to say it sounded like he was enjoying himself as we played. I found it quite fun as well which is why I hope down the road this game picks up in popularity because the more players you have in a round, the more fun the round tends to be. As it stands right now, it is nearly impossible to get even a half full round or even just one other player most of the time. Currently, and this could just be me not noticing it, there is no way to join a public online server with a friend but you can make a private one. So if there happened to be a couple other people online when we played, we couldn’t form a team and then join the online server. We would have to both just join the Online server and hope to get matched up. I’m assuming this is to avoid people from teaming up and making it unfair to everyone else, but it still would be nice to play with friends too. To help keep things interesting you get to select which character you want to play as. You can also choose which weapon they will be equipped with and which colour scheme you want your character to wear. As you play the game, you will unlock more character options and new weapons as well. The characters and weapons make no difference in gameplay, they are purely cosmetic. So should you get this game? Sadly, right now with the Online component being a desolate place, I can’t really recommend the game unless you have a group of friends you plan to play with. If you can get a group of six people all playing it at once, this game has the potential to be incredibly fun. It’s simple enough that everyone should enjoy it and has enough variety to keep it from quickly getting boring. With only two or three players the game tends to get a bit dull due to the stages ending so quickly. The game’s current hope comes from the fact the Developer is kindly giving an extra key to anyone who plays the game long enough. That key can then be shared with anyone you choose and in turn, if that person plays it long enough, another key will be given. This potentially means that you would need to buy the game just once in order for you and five friends to all be able to play the game making this game an excellent value with very little need to bother waiting for a sale because you likely will never get a cheaper price than buy one, get infinite free. Give Marooners a chance and once word gets out about it, I could easily see it becoming one of your favorite party games.